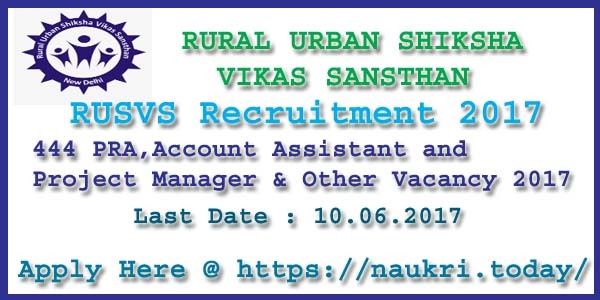 Dear Applicants, Rural Urban Shiksha Vikas Sansthan has released notification for 444 Project Manager, Assistant Accountant, Public Relation Assistant & Other Vacancy. Those candidate who are looking for RUSVS Recruitment 2017 can fill application form through online mode. You can submit online form for RUSVS Vacancy on or before last date, that is 10.06.2017. RUSVS is Popularly known as Rural Urban Shiksha Vikas Sansthan. RUSVS is Inviting online application for recruiting candidate on 444 Public Relation Assistant and Assistant Accountant Vacancy. Online registration for RUSVS Jobs has been started from 25.04.2017. For more details about Rural Urban Shiksha Vikas Sansthan Recruitment 2017 like eligibility criteria like education qualification , age limit and selection process is mention below. What is the Qualification Details for RUSVS Recruitment 2017 | Eligibility Criteria for RUSVS Office Assistant Jobs ? How to Fill Online form for RUSVS Recruitment 2017 | RUSVS PRA Vacancy @ ruralurbanshiksha.in ? For Post No. 01, 02 : Candidates must have done Graduation degree in respective trade for this vacancy from any recognized University. Post no. 03 : For this vacancy, Candidates should have passed Intermediate from any recognized Board. For Post No. 04 & 05 : Applicants must have done Matriculation from any recognized Board for RUSVS Public Relation Assistant Recruitment 2017. Age Limit for RUSVS PRA Jobs | Age Criteria for Rural Urban Shiksha Vikas Sansthan Recruitment 2017 : For Project Manager Post, age of the candidates should be in between 21 years to 40 years as as on 01.05.2017. For remaining post, age of the candidates for RUSVS recruitment 2017 should be in between 18 years to 27 years as on 01.05.2017. Age relaxation is applicable up to 05 years for SC/ST Category & 03 years for OBC category candidates. Application Fee for RUSVS Jobs 2017 | RUSVS Office Assistant Vacancy : Candidate of General and OBC Category need to pay Rs. 250/- for filling online form for RUSVS Recruitment 2017. ST/SC Category Candidate has to pay Rs. 150/- for RUSVS Public Relation Assistant Jobs. For Post No. 01 : Candidates will paid pay band Rs. 9,300/- to 34,800/- for Project manager Post. For remaining Post : Selected candidates will paid Rs. 5,200/- to 20,200/- per month for RUSVS Jobs 2017. Selection Process for RUSVS PRA Vacancy 2017 | Selection criteria for RUSVS Project Manager Jobs : Selection of candidate for RUSVS Office Assistant Recruitment will be based on Written Exam (Screening) Followed by Interview. Candidate firstly log on to official Website www.ruralurbanshiksha.in. Now Click On official notification for “RUSVS Recruitment 2017 “. Open and read all the eligibility details given in the notification. If you are eligible for RUSVS Vacancy 2017. Then fill online form by clicking on Online Application link.. Fill all the details in application form carefully and correctly. Recheck all the fill details in application form for RUSVS Assistant Accountant Vacancy. Click on Submit button and make the payment. RUSVS Recruitment 2017 For 444 Public Relation Assistant & Other Post. Candidates can fill online form for Rural Urban Shiksha Vikas Sansthan Recruitment from here before the last date 10.06.2017.